We’ve had a gallery wall at home for the last 18 months. It’s grown a fair bit over that time. As has my taste in art and design in general I guess. Bits and pieces have been added, changed, updated and moved about. It’s not a huge wall, but big enough to do something with. We can’t place furniture here or hang shelves as a door opens onto it. It’s not big enough to take a statement piece of art either because of where the light switch is. It’s a pretty limited space actually, but that hasn’t stopped me having itchy fingers. I wanted something more compact. A more cohesive look. I also wanted to save money by re-using the original frames. So, bright and early on a Sunday morning, the frames were taken down, walls filled and sanded, skirting board masked up, sheets put down and paint pots brought out. I was armed and ready. I’d also already received a cheeky little delivery earlier that week. Cue, Desenio a Stockholm based online art retailer who very kindly offered to send me some of their posters and prints to use in my projects… it was the most perfect timing. With my shopping list done and order placed, in less than a week later they arrived. Safe and sound and great quality. I was a very happy (and excited) bunny. Would you like to have a peep at our new wall? Our updated, very monochrome gallery wall, complete with a rollered paint edge. Mainly because I need to experiment, try something new, live with it. You know me, if I wouldn’t do it in my own home, how on earth can I sell alternative design ideas to you? I’m looking forward to everyone asking when i’m going to finish the wall…. why the decorator did such a rubbish job….. did I run out of paint? (I did actually – ha). I was originally going to paint the entire back wall black, but decided against it because of the white sockets, light switch and PIR sensor breaking it up. I wanted the artwork to stand out, not the unattractive plastic squares. So I decided to feather the edge out at the light switch and leave all the white stuff on a white section of wall. I really like it. I know some people won’t. I’d much prefer you to love or hate it though. Indifference is the worst. Out of the eleven posters Desenio very kindly gifted me (thank you), it was these five beauties below that now grace our hallway. It took me ages to whittle down my selection as there are over 600 prints and posters to choose from. The best bit… all Desenio’s posters fit standard Ikea frames. Ten bonus points for that. You know you can get your art up on the wall quick sharp, without the need to spend a fortune on bespoke framing. Don’t have a lifetime supply of Ikea RIBBA? No probs, you can now also get your frames from there too, including gorgeous copper and gold frames or Scandi style oak picture hangers. The gallery was interlaced with some of the original pieces, including the Gingerbread Man my son made at toddler group. I think we are destined to have that on a wall FOREVER. Little man is very protective over his masterpiece. Such a diva. The huge salvaged metal A was from my fave junk shop in Leeds, The Whole Kit and Kaboodle. I have to keep reminding myself i’m getting married this year and “K” will soon become “A”. Desenio are designing and producing bang on trend and affordable art. Perfect for so many Making Spaces projects where cost effective and accessible design is key. Most of their pieces are designed by their in-house team but they also offer special, limited edition collaborations with guest artists and designers too. So keep an eye out. I will be sure to share the remaining six prints on the blog soon. I’m just waiting to find the perfect space for them… and go frame shopping. So what do you think of the newly updated gallery wall? Do you like my art selections? 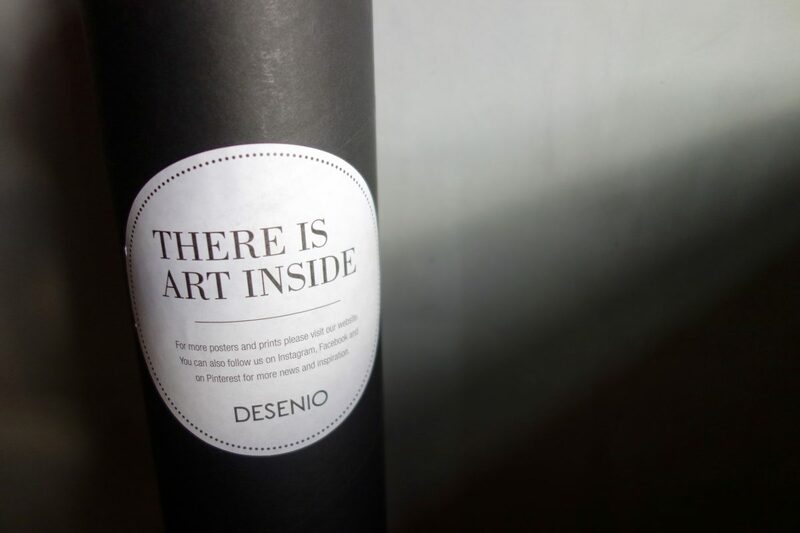 And have you clicked over to Desenio yet? I was very kindly gifted these posters by Desenio, but all opinions and words are my own. Always. And I only ever write about brands that I love or think you will love too. I found Desenio on IG several months ago and loved their affordable art but at the time they didn’t ship to UK. Glad they do now! Your little one’s Gingerbread Man fits right in with the other pieces. Your feathered edge is brilliant, I love it! I think that works brilliantly well with the two wall colours – it is a monochrome gallery theme, after all, so perfect! I love Desenio. I saw their ‘Be yourself, unless you can be batman…then be batman’ print. I really need to do a feature wall in our lounge. It’s such a long room and has a bare wall…Well, not bare because there is the blood of a smushed bug on it that I keep neglecting to clean and a picture hook without a picture…I really wanted the Jenni Sparks stuff but I will need to save my pennies…Or go for Desenio. I will be Rocking the Ribba frames! Snort! Well, the promise of gore might make ’em want to have a peep, that’s for sure!